Not many details are known about the Return Travels of Xuanzang from India to China. 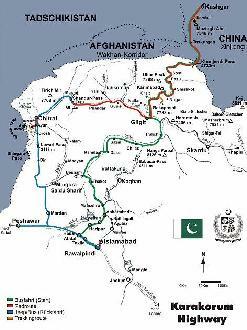 Records note that the Route first lead eastward from Peshawar (Pakistan) through the Khyber Pass -Today the Border between Pakistan and Afghanistan- in the Hindu Kush Mountain Range. From there Xuanzang passed through the City of Kashgar, to pass along the Southern Route around the Taklamakan Desert to visit Khotan. The Journey then led further Eastward through Niya (Minfeng) and back into the safety of the Great Wall of China of Tang Empire Era at Dunhuang. Xuanzang arrived in the capital, Chang'An, on the seventh day of the first month of the Year 645 AD, and a great procession celebrated his return. This Schematic Map shows the entire "Journey to the West" as made by the Chinese Monk Xuanzang (Hsüan-tsang) on the Silk Road between China and India in the years 629 AD to 645 AD. The Path of the Journey to led from the Chinese Capital in Shaanxi Province of China acros the Yellow River to the westernmost pass of the Great Wall of China. Via Xinjiang it continued into Kyrgyzstan, Uzbekistan, Tajikistan, Afghanistan, Pakistan and India. The Return Journey led through current day Pakistan and Afghanistan to reach Kashgar in current day Xinjiang-Uyghur Autonomous Region of China. Because the (Han) Chinese Cultural Zone during the Tang Dynasty Era only reached as far as Dunhuang, where the Great Wall of China began, Xuanzang had to travel south-east from Kashgar via Yarkant and Hotien (Khotan) along the South Route around the Taklamakan Desert to finally return to his native China in 645 AD. Xuanzang died as a National Hero in 661 AD. Most notable locations visible on this Map are Many. The listing begins with the Capital of the Tang Dynasty Empire, Chang'An (Today: Xi'An), at the Time the largest City in the World. From Kapisi Xuanzang pushed on to Jalalabad and the settlement of Laghman, where he considered himself to have reached India. Thus Xuanzang is considered to have reached India in the year 630 AD even though this section lies within the borders of Today's Afghanistan. After Xuanzang left Jalalabad in today's Afghanistan He passed through the Khyber Pass to Peshawar. From there he traveled Westward via the Khyber Pass to the east reaching the former capital of Gandhara of Peshawar, on the other side of today's Border. Once in Peshawar (Pakistan) Xuanzang visited a number of stupas in and around the settlement, notably the Kanishka Stupa. This stupa was built just southeast of Peshawar, by a former king of the city. In 1908 it was rediscovered by D.B. Spooner with the help of Xuanzang's account. Xuanzang left Peshawar and traveled northeast into the Tribal Area's and the Swat Valley, a current war-zone and part of the KKH or Karakoram Highway, the highest paved road in the world and even today very rough territory. Xuanzang recorded to have stayed in the village of Udyana after which he continued northward and into the Buner Valley, before doubling back via Shabaz Gharni to cross the Indus river at Hund. Thereafter he headed to Taxila, from where the journey naturally led into Kashmir today a Part of India. Here Xuanzang spent his next two years (631-633) studying Mahayana alongside other schools of Buddhism. During this time in Taxila, Xuanzang wrote about the Fourth Buddhist council that took place nearby, ca. 100 AD, under the order of legendary King Kanishka of Kushana. In 629 AD, Xuanzang reportedly had a dream that convinced him to journey to India. At the Time the Tang Dynasty and Eastern Türk Goktürks were waging war, for which reason the Emperor Tang Taizong had prohibited foreign travel (I.e. Travel beyond the Great Wall of China End Gate (during the Tang Dynasty Era) at Yu Men and Yanmen Guan-Sun Gate & Pass). The Travels of Xuanzang in China start at the Tang Dynasty Capital of Chang'An and lead Westward to Lanzhou to Cross over the Yellow River (Huang He'). From there the Path led via Qinghai Province into the Hexi Corridor of Gansu, bypassing Wuwei, but traveling through Zhangye and the Spring Lake Oasis at Jiayuguan to Anxi and Dunhuang. At Dunhuang the Route of Xuanzang splits. The Route to the North-West is the exit route through Yu Men - Jade Gate, used by Xianzang on his "Journey to the West" to India. The South-West Route is part of the Pathway through which Xuanzang returned in China, after 16 years of Travels and Learning. According to historic sources Xuanzang persuaded some Buddhist guards at the gates of Yumen and slipped out of the empire. He subsequently traveled across the Gobi Desert to Kumul (Hami) in current day Xinjiang-Uyghur Autonomous Region. From Hami Xuanzang followed the Tian Shan Mountain Range along its southern foothills to head westward, arriving in Turfan in 630 AD. (At Turfan Xuanzang met the King of Turfan, a Buddhist who equipped him further for his travels with letters of introduction and valuables to serve as funds). Moving further westward, Xuanzang escaped robbers to reach Yanqi, then toured the non-Mahayana monasteries of Kucha. Further west he passed Aksu before turning northwest to cross the Tian Shan's Bedal Pass into modern day Kyrgyzstan. The Xuanzang Route skirted Issyk Kul before visiting Tokmak at some distance northwest of Issyk Gul Lake. From Tokmak Xuanzang continued west then southwest to reach Tashkent (Chach/Che-Shih), the Capital of modern day Uzbekistan. Setting out again from Samarkand to the south, Xuanzang crossed a spur of the Pamir Mountains and passed through the famous Iron Gates (Bedal Pass) into Tajikistan. Continuing southward, he reached the Amu Darya River and Valley and traveled along its length the settlement of Termez. At Termez in today's Afghanistan Xuanzang found a thriving community of more than a thousand Buddhist monks. Further east he passed through in Kunduz, today a city in Afghanistan, where he stayed for some time. During his stay in Kunduz Xuanzang met the monk Dharmasimha, and was advised by the local Prince Tardu to continue his way westward through to Balkh (modern day Afghanistan), where he could have the opportunity to see the Buddhist sites and relics. Xuanzang and Dharmasiam traveled to Balkh and its Nava Vihara, or Nawbahar, which Xuanzang. At the Nawbahar (near Balkh) Xuanzang found over 3,000 non-Mahayana monks, including the Monk Prajnakara, a monk with whom Xuanzang studied early Buddhist scriptures. From the Balkh region Monk Prajnakara then accompanied Xuanzhang and Dharmasimha southward to Bamyan (today Afghanistan), where Xuanzang reported to have met the king and where there were many non-Mahayana monasteries, in addition to the two large Bamyan Buddha's carved out of the rock-face (The Bamian statues have been destroyed in 2001 AD). From Bamyan the traveling party then resumed their path eastward, crossing the Shibar Pass and descending to the regional capital of Kapisi about 60 km north of modern Kabul in Afghanistan. According to Xuanzang Kapisi sported over 100 Buddhist Monasteries and 6,000 monks, mostly of the Mahayana Variety. Xuanzang stayed for some Time at Bamyan and took part in a religious debate, demonstrated his knowledge of many Buddhist sects and came across the first Jain and Hindu People on his journey. 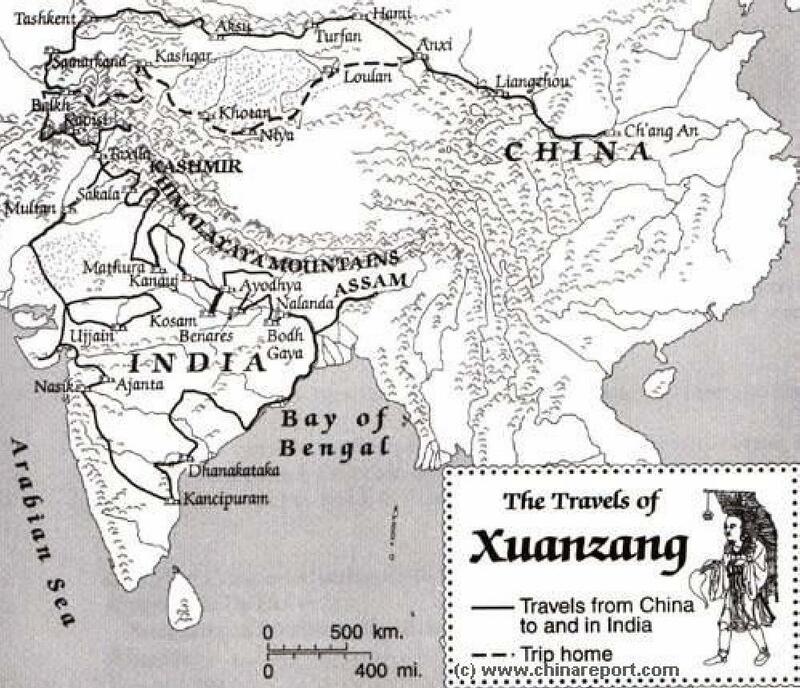 In 633 AD, Xuanzang left Kashmir and journeyed south to Chinabhukti (thought to be modern Firozpur), where he studied for a year with the monk-prince Vinitaprabha. In 634 he went east to Jalandhar in eastern Punjab, before climbing up to visit predominantly non-Mahayana monasteries in the Kulu valley and turning southward again to Bairat and then Mathura, on the Yamuna river. Mathura had 2,000 monks of both major Buddhist branches, despite being Hindu-dominated. Xuanzang traveled up the river to Srughna before crossing eastward to Matipura, where he arrived in 635 AD, having crossed the river Ganges. From here, he headed south to Sankasya (Kapitha), said to be where Buddha descended from heaven, then onward to the northern Indian emperor Harsha's grand capital of Kanyakubja (Kanauji). Here, in 636 AD, Xuanzang spent a considerable time in the city studying early Buddhist scriptures and Temples, before setting off eastward again for Ayodhya (Saketa), homeland of the Yogacara school. Xuanzang now moved south to Kausambi (Kosam), where he had a copy made from an important local image of the Buddha. Xuanzang then returned northward to Sravasti, and traveled through Terai in the southern part of modern Nepal (here he found deserted Buddhist monasteries) and thence to Kapilavastu, his last stop before Lumbini, the birthplace of Buddha. Reaching Lumbini, he would have seen a pillar near the old Ashoka tree that Buddha is said to have been born under. This was from the reign of emperor Ashoka, and records that he worshipped at the spot. The pillar was rediscovered by A. Fuhrer in 1895 AD. In 637 AD, Xuanzang set out from Lumbini to Kusinagara, the site of Buddha's death, before heading southwest to the deer park at Sarnath where Buddha gave his first sermon. Traveling eastward, at first via Varanasi, Xuanzang reached Vaisali, Pataliputra (Patna) and Bodh Gaya. He was then accompanied by local monks to Nalanda, the great ancient university of India, where he spent at least the next two years. He was in the company of several thousand scholar-monks, whom he praised. Xuanzang studied logic, grammar, Sanskrit, and the Yogacara school of Buddhism during his time at Nalanda. From Nalanda, Xuanzang also went east to the ancient city of Pragjyotishpur (modern Guwahati) in the kingdom of Kamrup (modern Assam) at the invitation of its Buddhist king Kumar Bhaskarbarma. Later the king escorted Xuanzang back to the Kanuj at the request of befriended king Harshabardhan to attend a great Buddhist council there which was attended by both the kings. Xuanzang turned southward and traveled to Andhradesa to visit the famous Viharas at Amaravati and Nagarjunakonda. He stayed at Amaravati and studied 'Abhidhammapitakam'. He observed that there were many Viharas at Amaravati and some of them were deserted. The last recorded place of visit was Kanchi, the imperial capital of Pallavas. This Schematic Map shows the entirroute Map of the first ever recorded journey between China and India as made by the Chinese Monk Faxian in the years 399 AD to 412 AD. The Path of the Journey is less clear than with the later Monk Xuanzang but led though Lanzhou, Dunhuang and Turpan, as well as Khotan and further led through various Central Asian terriitories today part of Kyrgyzstan, Afghanistan, Pakistan and India. 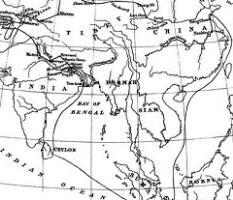 The Return Journey lwas made by ship and led from the Bengal Coast via Ceylon (Sri Lanka) and parts of current day Indonesia back to the Chinese Coast. Faxian is known to have arrived back in the year 412 D. His recordings and adventures becoming famous in all of China where they remain legendary to this day.